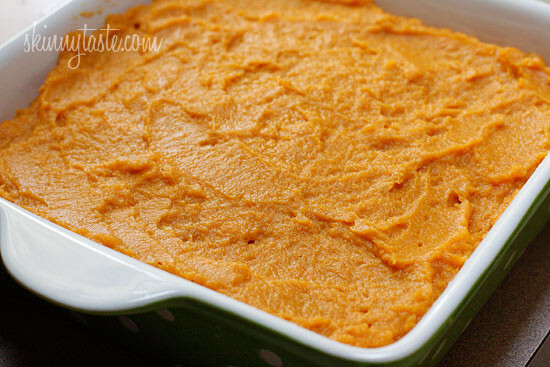 Mashed sweet potatoes with a hint of cinnamon and nutmeg! 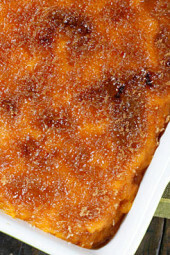 This easy sweet potatoes recipe is topped with a caramelized brown sugar crust. 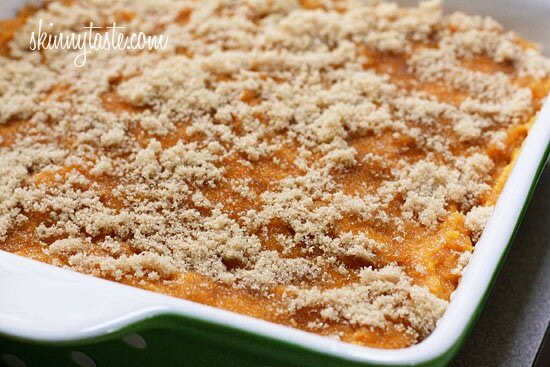 Sweet potatoes are a must for Thanksgiving and this dish will be a hit on your Holiday table. I am starting to post Thanksgiving recipes since it’s right around the corner, so we are testing out lots of side dishes in my home. 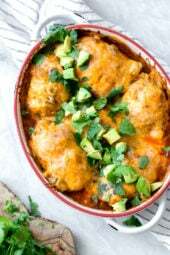 We really loved this recipe, I can happily say this is the dish that finally turned me into a sweet potato fan. Previously I only enjoyed them as sweet potato fries, or in a sweet potato pie, but I will certainly be making this again and again. To prepare ahead, make the mashed sweet potatoes the day before, then re-heat them before topping with sugar and broiling. Once you broil them, you’ll want to serve them right away. If you are bringing them to someone’s house, don’t add the brown sugar topping until you are ready to serve. 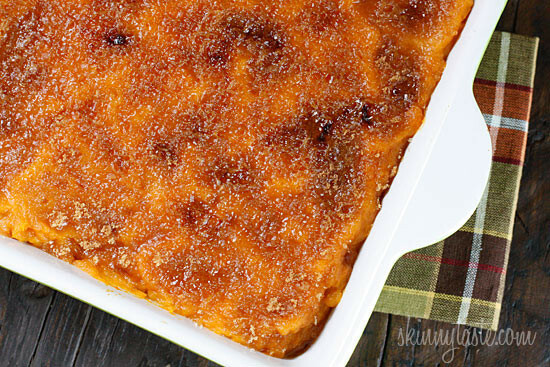 Mashed sweet potatoes with a hint of cinnamon and nutmeg, topped with a caramelized brown sugar crust. 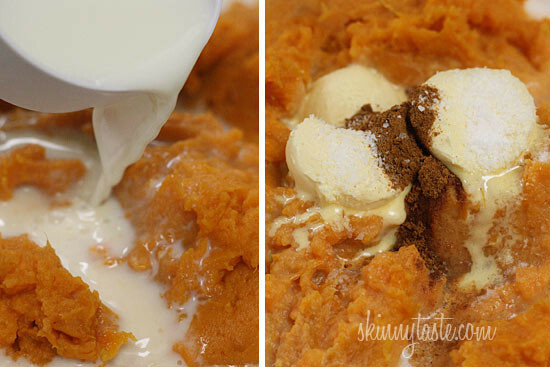 Sweet potatoes are a must for Thanksgiving and this dish will be a hit on your Holiday table. Sprinkle 1/2 cup brown sugar evenly over top. Broil 2 minutes or until sugar melts, careful not to burn. Let it stand until the melted sugar hardens (about 5 minutes). If I make the sweet potatoes ahead of time and assemble them the next day, can I mix everything and bake in oven until warm and then do brown sugar broiling part right before serving? I made these last year and they were a bit runny. I'm assuming just add less milk? Also, it was hard to get the crust right – some parts where melted while others were burning – does anyone have any tips? I placed the oven on Broil and had it in the middle rack. The sugar was sprinkled pretty evenly as well. Alisa – I know this was a year ago, but in case anyone else has this question, I thought I’d chime in. I have a little kitchen torch that would be great for filling in any non-crisped sections. They’re under $20 and I use mine for creme brulee mostly, but sometimes we just sprinkle sugar on banana slices and crisp that up. This post for sweet potato brulee might be 3 years old – but I made this today and it was a total hit with everyone! 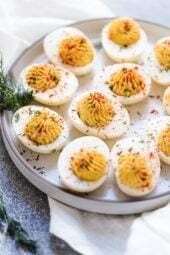 I boil my SP whole then peeled, mashed with the ingredients, gave it a quick run under the broiler and made a 45 min trip to Aunt's house.. they were perfect! WAYYYY too many carbs and too much sugar. If I make it it will be with coconut milk and Splenda brown sugar substitute. I love sweet potatoes but this can be toned down for we diabetics. 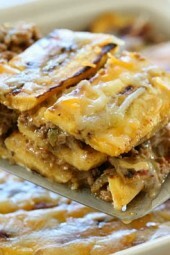 Looks good, but when I calculate the calories I get 200 per serving dividing the recipe by 14. Are you sure your calculation is right? Browsing your site for Thanksgiving recipes. This looks awesome. Thinking of making potatoes in the crock pot. This way I can assemble just before the turkey is done, then pop this in the broiler for a cpl minutes. Always a challenge trying to getting everything done at the same time. This is very good, I found just a slight bit too much milk so add slowly….